The AquaCera Traveller XL Gravity Fed Filtration System With No Filters is an easy pour through design that has a compact size and superior performance that makes it the perfect choice for Emergency Disaster Preparedness, Apartments, Boats, RV's cottages and travel. Many International Organizations use this product such as The International Red Cross, Unicef, Oxfam, U.S. & British Embassies, Hong Kong Health Department, Save the Children Fund, and Medicare International. Note: The AquaCera Pioneer SS4 is also known as the AquaCera W9371830 SS-4, Doulton SS4, British Berkefeld SS4, and the Big Berkey. The System holds up to 4 ceramic filters. 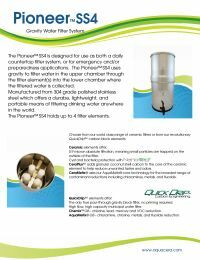 Choose between the CeraPlus™, CeraMetix®, and Imperial CeraMetix® GF filters, systems are sold with 4 7" filters included. Since 1989, the AquaCera brand has been designing water filtration systems and filter candles designed to remove the most difficult of contaminants. The AquaCera Pioneer SS4 Gravity Fed Water Filtration System holds up to 4 ceramic filters to remove the toughest contaminants from your drinking water. SS4 System Features. This system is made from high-grade stainless steel and features an easy pour through design. The upper reservoir hold 2.5 gallons of untreated water while the lower reservoir hold 2 gallons of treated water. 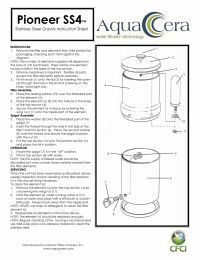 The SS4 Gravity Fed Water Filtration System holds up to 4 ceramic filters. These filter candles reduce many contaminants such as chlorine, cysts, parasites, pathogenic bacteria, sediment, dirt, and rust. By eliminating these contaminants it will greatly improve the taste of your drinking water. Countertop Convenience. Countertop water filtration systems are perfect for small families, RVs, yachts, apartments and second homes, or anywhere where space is limited. Not only do they provide the convenience of clean drinking water, they also produce clean water for many applications related to health products, such as dental products, vaporizers, humidifiers, CPAP machines, lead-acid batteries, engine cooling systems, steam irons, waterfalls, fish aquariums, and many more.